To echo East Clinton Middle School Principal Robbin Luck’s line, you could get sand between your toes. There are a number of eye-catching constructed palm trees and other beach-related decorations set up in the building. From background to foreground are students Dakota Collom, Kaitlyn Kratzer and Chloe Jones. Bryan Floyd, foreground, who is affiliated with the Brett Wightman Foundation, speaks to the East Clinton school board. Seated in the background is East Clinton Director of Instruction Terri Barton. LEES CREEK — This fall’s reappearance of an East Clinton homecoming parade and the response to it have district officials hoping to boost future Astro homecomings and the school spirit that goes along with them. 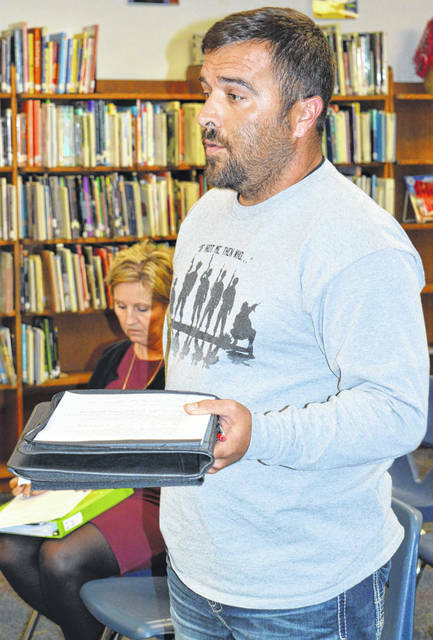 In his report Tuesday to the school board, East Clinton Superintendent Eric Magee said that over the past several years a big topic has been what to do for football homecoming and how to do it. This year they went back to holding a parade, which was at Sabina in the northern part of the school district. Though it rained a little before the parade started, Magee said he thought it was very well-attended. “I thought it was a successful event,” the superintendent said. The hope, he said, is the parade will grow in size and be the best it can be, with both Sabina and New Vienna looking forward to hosting it. Plans are for the parade to alternate between the two towns from year to year. Homecoming parade floats have been a big deal in the past, said Magee, and school leaders want them to be a big deal again. 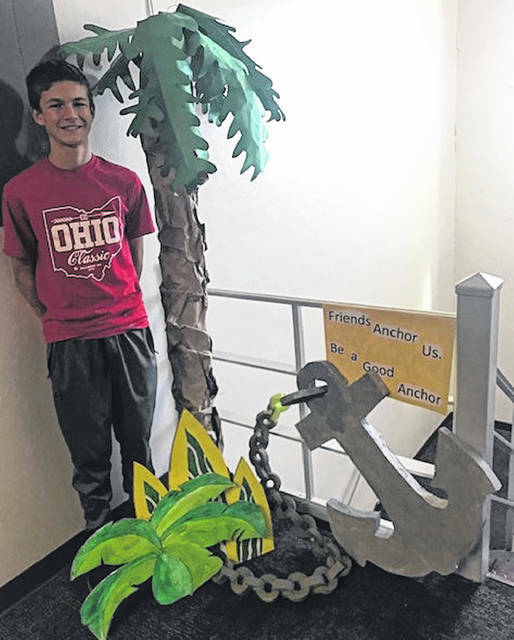 There is an idea to have high school seniors help teach school spirit to freshmen, and have multi-grade groups instead of grades build the floats. In connection with homecoming this fall, there also was a bonfire activity and during the week leading up to the homecoming game there were “spirit days” with themes. Magee encouraged residents to give input on how to make the parade the best it can be. The board of education session was held at the East Clinton Middle School. The theme there for October is BEACH, and there are a number of eye-catching constructed palm trees and other beach-related decorations set up in the building. Middle School Principal Robbin Luck said BEACH stands for “Be kind, Encourage, Assist, Care, Help”. 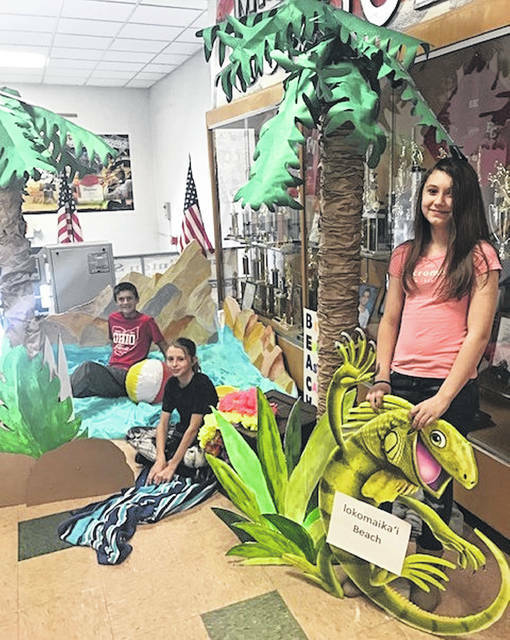 “Several of our kids can’t go to the beach, so we brought the beach to them,” she said. School counselor Valerie Stuckey, other staffers and students helped decorate the building. The middle school’s current total enrollment is 302 students, said the principal. That breaks down to 113 sixth-graders; 103 seventh-graders; and 86 eighth-graders. East Clinton Director of Instruction Terri Barton reported to the board that “digging deeper into students’ [skill] deficits is something we need to do to help the kids who are struggling.” To that end, the Renaissance Star software being used provides excellent detailed reports for identifying students’ skill levels to help teachers plan instruction and intervention, she said. According to the Renaissance Star website, Renaissance Star delivers progress monitoring and student growth data teachers need to make informed decisions. Speaking about grades K through 2, Barton said teachers are providing support in the classroom through small-group reading instruction, plus Title teachers have those same children on their caseloads. Bryan Floyd, who is affiliated with the Brett Wightman Foundation, said Foundation board members are disappointed in the small number of East Clinton students who apply for the $1,000 Brett Wightman Scholarship. Two people applied last year, he said. Lance Cpl. Brett Wightman, an East Clinton graduate, was one of 14 U.S. Marines killed in an August 2005 roadside bombing in northern Iraq. Election Day is approaching and there will be informational round-tables for the public on Thursday, Oct. 18 concerning the East Clinton bond issue. The times and places are: at the high/middle schools in Lees Creek from 4:30 to 6:30 p.m. Thursday; at the Sabina Elementary School from 5 to 7 p.m. Thursday; and at the New Vienna Elementary School from 5 to 7 p.m. Thursday.